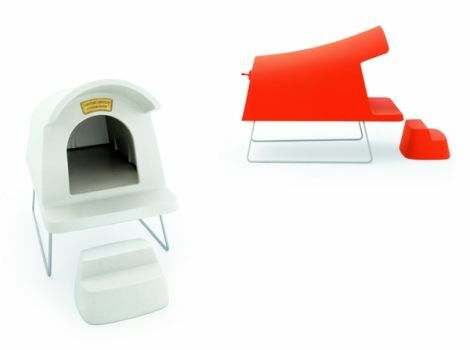 if you are a pet lover you will appreciate this very cool looking dog house from uk born, hong kong-based designer michael young. this chic and cheerful home (with its frame) is 19″w x 35″l x 29.75″h, and is meant for pets under 40 lbs. 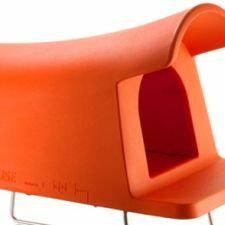 the raised style helps to protect your precious pooch from the elements, and the polyethylene material ensures that it is durable and easy to clean. 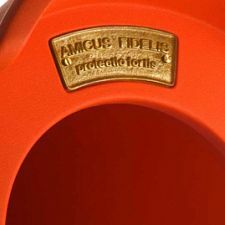 bonus: a brass plate above the door which states “amicus fidelis protectio fortis” or “faithful friend, strong protector.” find the dog house at generate and see more designs from michael on his website. Are this items for purschase? i am not sure which birdbath you mean? let me know if you find one — contemporary birdbaths are not easy to find.